Take on the season's gladiator trend with the knee- high Sarita sandal. 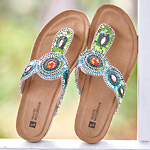 This must have warm weather silhouette has amazing features to make it super easy to slip on and off. The straps feature adjustable buckles for the perfect customized fit. Adjust them to your liking and then use the full back zipper to get them on and off. 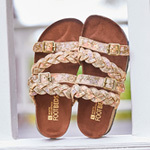 The center straps are subtly decorated with rounded studs.